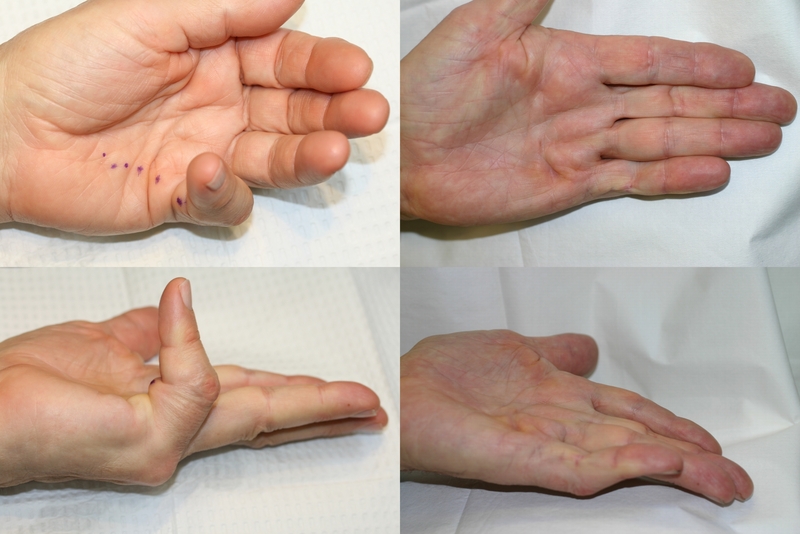 The current recommended treatment of Dupuytren’s contracture is surgical removal. Fasciotomy, is recommended as treatment, in general, only for the very aged or infirm. 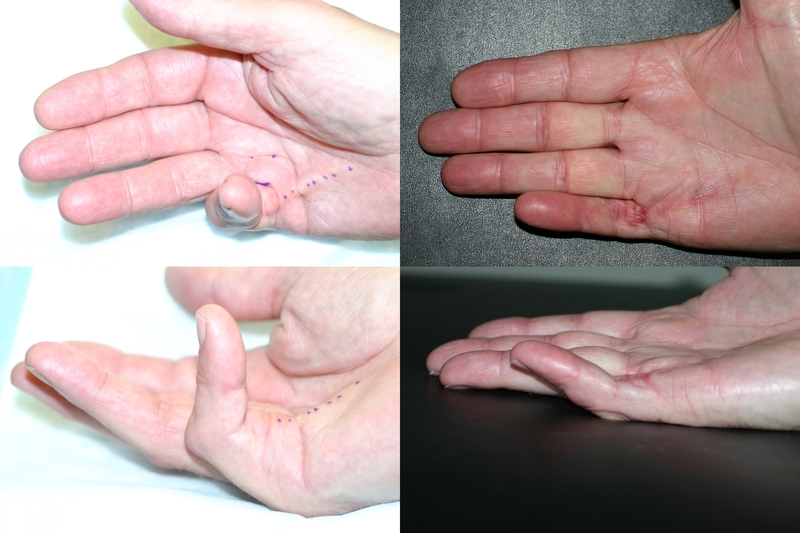 This study documents 102 consecutive, Stage IV Dupuytren’s contracture patients treated via subcutaneous fasciotomy. All fasciotomies were performed, wide-awake, as an office procedure under local anesthesia with epinephrine. Cords were released with an 18 or 25 gauge needle followed by sequential rupture via distal stretching of the finger. Out 114 digits treated, 103(90%) were available for follow-up for measurements and assessment of complications. Average follow-up was 6.6 months, and the median follow-up was 3.5 months. Average total pre-operative loss of extension was -147 degrees. Average total post-operative loss of extension was -55. Total average gain in motion was 92 degrees. The MCP joint on average gained 51 degrees of extension and the PIP joint gained on average 38 degrees of extension. There were no injuries to nerves or tendons, hematomas, or cases of RSD. Four patients required skin grafts near the PIP joint, two became infected and were lost with one that developed osteomyelitis and required subsequent PIP amputation. The other graft loss was in a diabetic. There was one other infection. Two patients developed an immobile DIP joint. Two patients required skin suturing at the time of fasciotomy for skin tears. Other minor tears were left to heal. 1) Needle aponeurotomy is an effective first-step office technique with immediate results and a low complication rate. 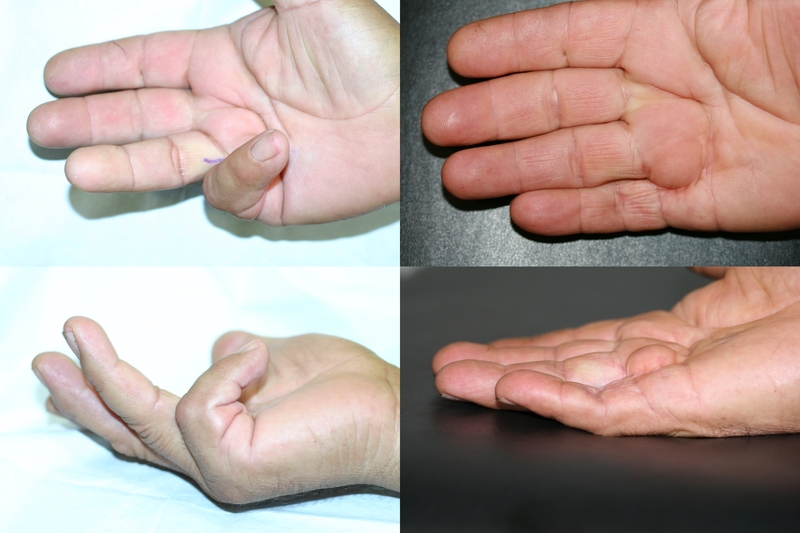 2) Recurrent disease occurs at a significant rate, over time, after any surgical incision or excision for Dupuytren's. Needle aponeurotomy as a first step does not prohibit future surgery and can take a patient from Stage IV to Stage II prior to open surgery. 3) It offers excellent short to medium term solutions. In some patients it may be a long term solution. 4) Early recurrence or late recurrence may be successfully treated in the future via repeat aponeurotomy, or surgery. Follow-Up Months Photo Quadruplet Series #1: 23.5 months, #2: 19.6 months, #3: 8.9 months, #4: 13 months.